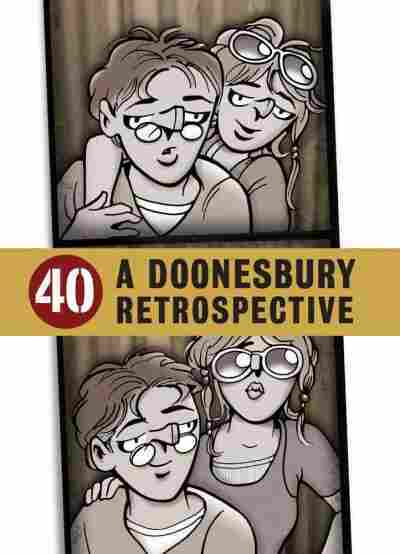 Trudeau Reflects On Four Decades Of 'Doonesbury' Forty years ago, freshman Mike Doonesbury met his roommate at Walden College, and since then, the funny pages haven't been the same. Cartoonist Garry Trudeau reflects on the beloved, irreverent strip, which he first sketched as a Yale undergrad in 1970. Oct. 26, 1970: In the first published Doonesbury cartoon, B.D., a preppy athletic type, meets his new college roommate, nerdy Mike Doonesbury. 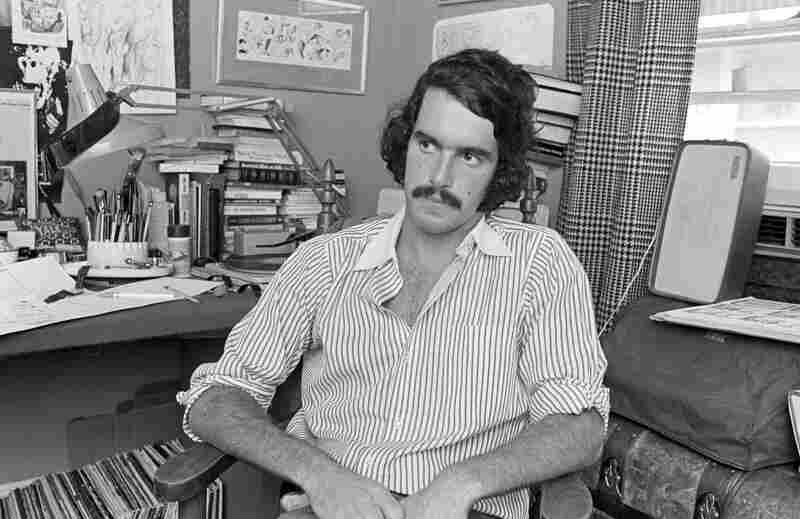 Garry Trudeau was still an undergrad at Yale when his cartoons were first syndicated. Forty years ago this morning, nerdy freshman Mike Doonesbury met his roommate at Walden College, and since that day, the funny pages haven't been the same. Trudeau started drawing Doonesbury in 1970 as a Yale undergrad. "It was basically a sports strip," he tells NPR's Renee Montagne. But he soon had to scramble to find a way to sustain the strip's humor on a grander scale. "Comic strips are like a public utility," Trudeau says. "They're supposed to be there 365 days a year, and you're supposed to be able to hit the mark day after day. And I had no idea whether I could do that." In the four decades since its humble beginnings, Doonesbury has become much more than a sports strip. 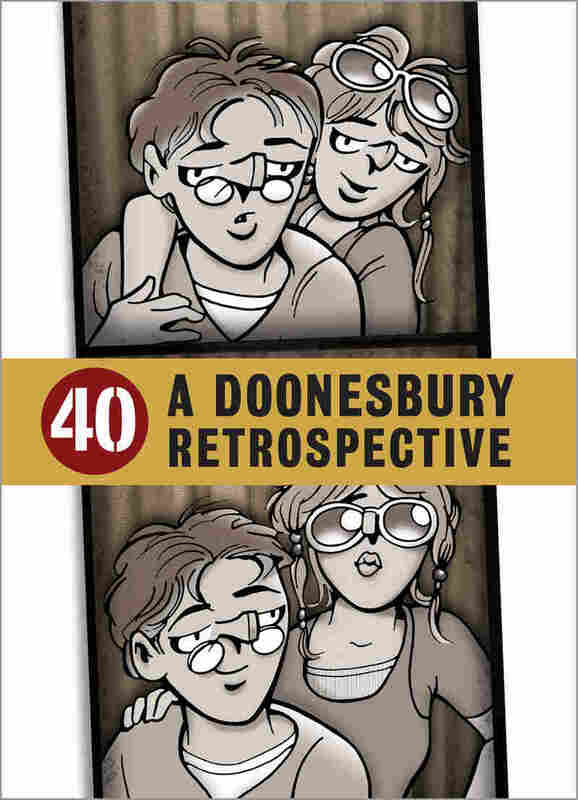 Trudeau marks his characters' 40th anniversary in the hefty new collection 40: A Doonesbury Retrospective. Trudeau, 24, at his office in December 1972. "It was an utter novelty," Trudeau, now 62, says of Doonesbury. "Nobody had seen anything quite like it." Trudeau developed Doonesbury around three foundational characters -- everyman Mike Doonesbury, football quarterback B.D. and campus radical Mark Slackmeyer. They represented the center, the right, and the left, Trudeau says. The strip wasn't an instant hit -- at first it was syndicated in just 26 papers. But Doonesbury's popularity quickly grew -- a success that Trudeau attributes to the novelty of a cartoon that took on the nation's generational divide. "Nobody had seen anything quite like it," Trudeau says. "The way we framed it was: These are dispatches from the front lines ... of youth. You know that the creator is on the bus and he's sending us reports from the counterculture movement." As Doonesbury grew in scope, the characters started coming into their own. In early comics Mike Doonesbury was drawn without a mouth. "I'm not sure what that was about," Trudeau admits. He suspects he was "trying to find a way to depict the character so that he remained as deadpan as possible." Then there's the quarterback B.D., with his signature helmets -- a detail that Trudeau says "took on a kind of metaphoric significance that was wholly unintentional." Trudeau initially had the idea that B.D. would keep his football helmet on to impress young women -- how else would they recognize who he was if he wasn't in his uniform? "But then it kind of took on some new meaning as he moved through life and I replaced the helmet with other helmets," Trudeau says. "He changed [football] teams, he became a National Guardsman, he became a California highway patrolman, and finally he became a soldier in both Iraq wars." In 2004, B.D. lost a leg in the second Iraq war, and Trudeau drew B.D. without his helmet for the first time in 34 years. It was a stunning moment for the strip's longtime readers. "Many found it moving to see his graying, matted, sweaty hair revealed for the first time," Trudeau explains. "It conveyed a kind of vulnerability. It sent the message that for him, life would never be quite the same. That he had to struggle to move into the life of a wounded warrior and find out what that new normal looked like." As readers got to know Trudeau's characters over the years, they began taking on lives of their own. In 1974, feminist Joanie Caucus earned her law degree from the University of California, Berkeley's Boalt Hall -- both in the cartoon strip and in real life. As Joanie considered where to go law school, programs from around the country began sending Trudeau applications. He didn't send the applications back, but he selected Berkley's Boalt Hall -- for "no particular reason" he says -- and the law school simply treated Joanie as a real student. "I got all the mailings, and student ID, and had to fill out all the forms," Trudeau says. "When she graduated, her class invited me to come speak. And they put a mortarboard on her chair in the front row. I made the speech as if she in fact were not imaginary and was graduating with the class." Mark "Megaphone" Slackmeyer's long career in radio culminates with his NPR interview program, All Things Reconsidered. Joanie's story resonated with many of the Berkeley students at the time. "Boalt Hall was unusually friendly to women law students, and particularly women who were returning after raising families," Trudeau explains. The graduating class of 1974 included many women who, like Joanie, had decided to change the course of their lives by applying to law school. 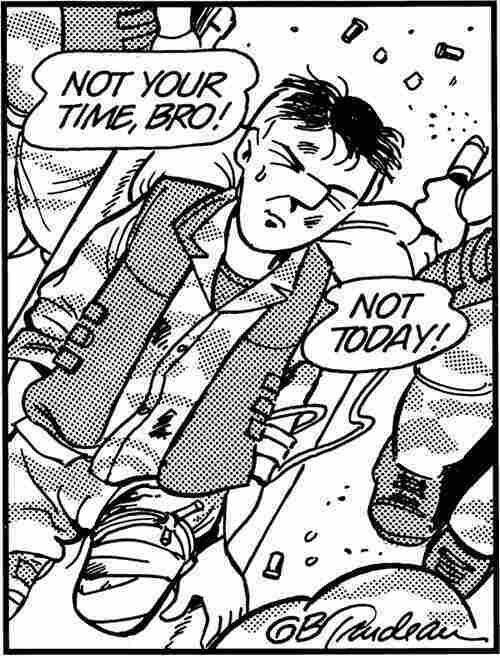 For many loyal Doonesbury readers, the character who has undergone the most powerful transformation is B.D. In 1972, the popular quarterback of Walden's football team went to Vietnam to get out of writing a term paper. By 2004, the former athlete had served in three U.S. wars and lost his leg -- not to mention his symbolic helmet. These dramatic plot decisions didn't come easily to Trudeau -- especially the decision to seriously injure B.D. in battle. "Normally I don't shoot any higher than verisimilitude," Trudeau says. "But in this case, I really had to sweat the details. I had to more closely observe what B.D. might be going through psychologically. And as a result the strip kind of took a more naturalistic turn. It's not as surrealistic as it used to be -- but it's been an astonishing journey for me." While working on the congressional campaign of her University of California, Berkeley law school roommate Virginia Slade, Joanie Caucus was interviewed by East Coast reporter Rick Redfern. A memorable weeklong wordless slow-mo pan of dailies ended with the couple in bed together — a strip that more than 30 newspapers chose not to print. MIT students picketed The Boston Globe with signs reading, "Joanie, we forgive you." Marriage, a son, and long careers in the nation's capital followed. In 1974, urged by one of her day care charges — "Dare to be great, Ms. Caucus" — Joanie applied to law school. Accepted by Boston University, Georgetown, Golden Gate State and UC Berkeley, she chose Berkeley. When Joanie's class graduated in 1977, a mortarboard on an empty seat marked her spot, and Trudeau delivered the commencement address. The San Francisco Examiner reported that Caucus received a job offer from a Southern California law firm. Instead, she took a job working for Rep. Lacey Davenport, and she later served in the Justice Department. One of former Ambassador Duke's boldest exploits involved parachuting into Iran on behalf of Universal Petroleum in a doomed attempt to restore the flow of oil out of that country. His capture and sentencing to death by firing squad led to many months of ominous absence, during which time his presumed death played havoc among his associates on the home front. When 52 American hostages who had been held in Tehran by militant Islamist students for 444 days were finally released, a 53rd hostage — "the bald spy" — was also given his freedom. The marriage of Mike and J.J. did not fare well during their years on Manhattan's Lower East Side: J.J. reveling in the art scene, with club installations and performance art; Mike struggling with his career as an ethically compromised adman. But their separation was interrupted when Mike saw J.J. giving birth, live on cable TV, and rushed to her side. The arrival of daughter Alex reunited them amid the shock of parenthood, which was only somewhat ameliorated by employing the services of nanny Zonker Harris. Former student radical Mark "Megaphone" Slackmeyer, who famously covered Watergate on the campus radio station, smoothly segued into a long career in radio, culminating with his NPR interview program, All Things Reconsidered. Although he had privately come to terms with his gayness several years before in the strip, it was during an on-air interview with conservative pundit and future spouse Chase Talbot III that Mark accidentally outed himself. When one of the Mike's Summer Daydream sequences turned out to come true, the strip's ur-character found himself ensconced in Seattle's coffee culture, working for college pal Bernie's computer company. An unexpected romance with brilliant young bug-checker Kim Rosenthal (familiar to longtime readers as an orphan airlifted out of Vietnam in 1974) followed its bumpy course to a family business (with the way-capable Alex) and a family. Naturally, ex-wife J.J. introduced an element of chaos into Mike and Kim's wedding ceremony, an event which Alex participated in with unrestrained enthusiasm. Few developments in the strip have had greater impact than B.D. 's being blown up by a rocket-propelled grenade near Fallujah in April 2004. Readers found themselves unexpectedly moved by his loss of a leg — and his ever-present helmet — and for months posted moving testimony on the Doonesbury website's Blowback page. For six years, the strip has tracked his journey of physical and psychological recovery, as B.D. has revealed himself to be one of the strip's most complex and transformed characters. Two books about his journey, The Long Road Home and The War Within, raise money for Fisher House. TBI (traumatic brain injury) is the signature wound of the Iraq and Afghanistan conflicts, and when Spc. Leo Deluca (aka "Toggle") was blown up by a vehicle-borne improvised explosive device, he began a journey of recovery that has brought out the best in B.D., his former commander. Key to Toggle's engaging story is an improbable Facebook romance born out of a shared love of alt music — with a whipsmart MIT techie named Alex Doonesbury.